Hundreds of shimmering X-ray sources captured by a NASA telescope illuminate a distant spiral galaxy similar to Earth's own Milky Way. NASA's Chandra X-ray Observatory captured this image of Messier 51, nicknamed the "Whirlpool Galaxy" for its swirling arms of stars and dust. It's about 30 million light-years from Earth and astronomers think it could be home to several black holes. Most of the purple light in the image is thought to come from X-ray binaries — systems that contain a dense neutron star, or in more rare cases, a black hole, sucking up matter from a neighboring star. The strong gravitational pull from the neutron star or black hole heats the material flowing from the companion star to millions of degrees. The Chandra telescope can spot these hot streaks of stellar material. Ten of the X-ray binaries in the Whirlpool Galaxy appear so bright astronomers think there is a chance they contain black holes with neighboring stars larger than the sun. That's because huge gusts of stellar wind would flow from the large stars into the black holes, generating massive amounts of energy and hot matter that produce X-rays. While the hot X-ray emissions detected by Chandra are shown in purple, the image also combines visible light captured by the Hubble Space Telescope shown in red, green and blue. The purple areas that appear fuzzy are thought to be superheated gas left over from supernova explosions of giant stars. 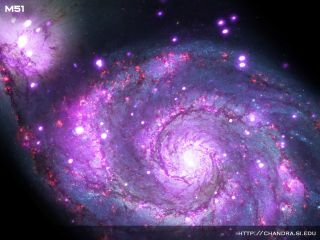 The Whirlpool Galaxy is merging with another smaller galaxy in the top left corner of the image, and astronomers think the two galaxies slamming into each other is creating a wave of star formation. The largest newly formed stars will likely speed through their life cycles in just a few million years, and then collapse in on themselves to form black holes or neutron stars, and create more X-ray binaries. The $1.65 billion Chandra telescope is specifically designed to pick up superheated regions in space. Because Earth's atmosphere absorbs X-rays, the telescope must orbit 86,500 miles (139,000 kilometers) above the planet. Chandra launched in 1999 and will continue scanning the universe for hot regions like the remains of exploded stars, material surrounding black holes, and the separation of dark matter from normal matter during galaxy collisions.